Successful people who achieve success and get the things they want aren't extraordinary. Their results may well be extraordinary. But they're not. Of course that's not to say that they don't deserve applause or commendation. People who achieve success simply decide what they want and they go after it. They set a goal. Make a commitment and they stick to it. What is the fastest most effective way to get what you want? Thinking about what you want more often & taking action towards it more often will swing the law of averages so far in your favour you can't fail. Why don't more people get what they want? If you fail to create the HABIT of THINKING ABOUT and TAKING ACTION TOWARDS your goal then you'll be susceptible to failure from the start. Why is it essential to make goal related thought and action habitual? Anything else would be relying on willpower which will fade. This is normal; willpower's purpose is to provide short bursts of focused concentration. As a simple example, let's imagine 3 versions a journey of 100 steps that you'd like to take. How long would it take you to get there if you took a single step on an occasional basis - whenever you happened to think about it? What about if you planned in advance to take say one step a day. You set a reminder on a Post-It note stuck to your bathroom mirror and you make the walk with the extra step each day upon seeing the note. Let's go a step further. You really want to take the journey; you're really fired up about it. You stick the Post-It to the back of your hand and make a solid commitment that each time you see the note you think about the goal, you remember the strength of the initial enthusiasm and what achievement would mean, and you take another step as soon as possible. By using method three you will soon develop the habit of thinking and acting upon your goal. By doing this you'll gravitate towards your goal; that result that you truly desire. You will be successful. Your results will be extraordinary. And it will be you that deserves applause and commendation. Learn how to progress to your goal achievement in an efficient, effective way; the right way that leads the fastest possible goal achievement for you. 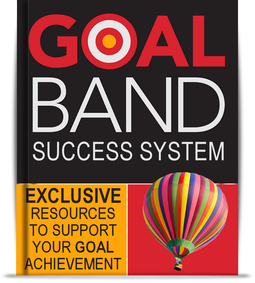 The GoalBand Success System contains all you need to know about tracking and comes complete with tracking resource materials. The Success System is usually £99.00 though is currently provided free with every GoalBand.